Our Varmint bullet line includes those bullets that are most commonly used by precision oriented varmint hunters. These bullets are proven in the field to provide exceptional accuracy and a level of expansion that best suits a given varmint or predator application. The J4 Precision Jacket is thinner at the nose. These jackets are cut to size by a process known as pinch trimming. This pinch trim produces a bullet tip that is very thin and will expand quickly (impact velocity and animal size will effect expansion results). Our Varmint bullets are made with the same materials and process as all of our bullets. This produces a level of consistently that directly impacts a varmint hunter’s ability to get more hits in the field. 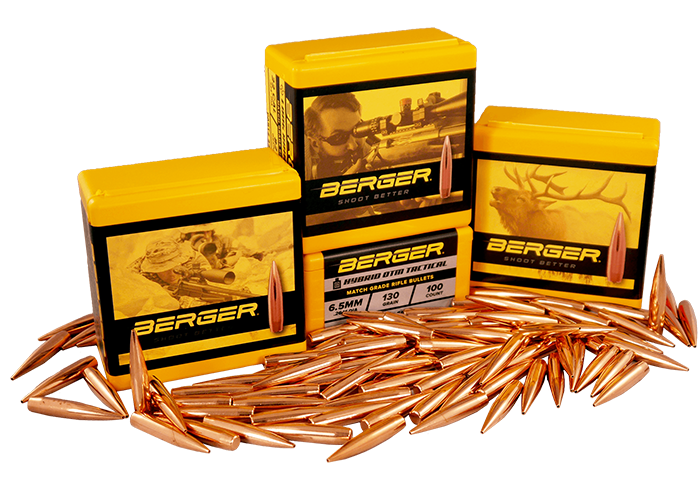 Berger produces a full line of flat base bullets in several calibers. We consider the flat base bullet a staple of extreme precision bullet makers. These bullets are used most often by short range target and varmint shooters who are focused on the tightest possible accuracy. The ability for a bullet maker to produce very accurate flat base bullets is a significant indicator of how focused that bullet maker is on consistency. Flat base bullets are the easiest to make consistent since flat is always flat. No boat tail tooling or considerations during the manufacturing process need be made. The vast majority of flat base bullets are made with a tangent ogive which is easier to produce than the secant ogive. The tangent ogive is also easier than a secant ogive to make shoot well. A tangent ogive of the same length as a secant ogive will not perform as well in the wind however these bullets are used primarily for 300 yards or less so this is of little concern. We make a few bullets which will be listed on the box as “HighBCFB”. These are bullet are made with a special design that works best as a short to medium range varmint/predator bullet. These bullets are available only in 6mm (.243 diameter). They are made using a flat base and a secant ogive just like our VLD bullets. Those who like using the 6mm for predator hunting at ranges past 150 yards find that these bullets are very effective. The bullet design that we refer to as our “boat tail” or “BT” or “non-VLD” is a design that includes a boat tail of course but more importantly these bullets include a tangent ogive. This is an important distinction because our VLD design includes a boat tail but is made with a secant ogive. The tangent ogive boat tail bullet is a common design among many manufacturers. These bullets are easy to make shoot accurately and can perform very well as a dependable target and varmint bullets. The tangent ogive does not cut through the wind like the secant ogive of a similar length but it more than makes up for this with precision that is easy to achieve in most rifles. Some of our Long Range BT bullets are made with extra long tangent shape noses which makes them perform better in the wind however these extra long nose BT bullets must be used by those who have a clear understanding of COAL layouts, changes, chamber dimensions, how these things are measured and how they influence precision. Our Long Range BT bullets were designed for long distance competitive target shooters. These bullets are made with extra long tangent ogives. This gives these bullets the combined advantage of a high BC while at the same time, they are easier to make shoot than bullets with a secant ogive. The Long Range BT bullets are a recent addition to our line, but they have already proven themselves by setting records and winning major competitions all over the world. The Long Range BT bullet design also extends into two more naming conventions; the Fullbore and Juggernaut. These LRBT bullets still have the same design specifications, but their names help to signify their purpose. The Fullbore bullet was designed specifically for Fullbore style shooting while the Juggernaut was designed so that it will keep going until it hits the target. The Hunting bullet line is proving to be the most lethal big game hunting bullets available. All of our Hunting bullets are made in the VLD or Hybrid designs. These designs incorporate a sharp nose and slightly thinner jacket that allows the bullet to penetrate 2” to 3” before it starts to expand. After the bullet starts to expand it will shed 40% to 85% of its weight as shrapnel into the surrounding tissue (internal organ). The combination between the shrapnel and the hydrostatic shock produces a massive wound cavity within the vital area (internal organs) that will be 13” to 15” long. This massive wound cavity results in the animal dropping fast since most go into shock after such a tremendous blow. Those animals that don’t go down immediately will soon succumb to blood pressure loss and/or organ failure producing a quick ethical kill. Our bullets don’t poke through like an arrow (high weight retention, deep penetration bullets) but instead dump their energy where it is most effective, inside the animal. 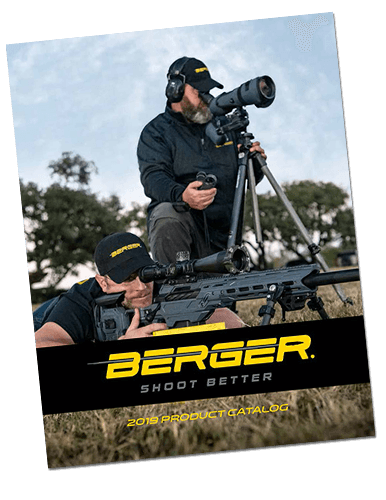 Using the Berger VLD will result in an animal that goes down fast so you can enjoy the results of your hunt without having to track the wounded animal after the shot. You owe it to yourself to see how accurate and deadly the Berger Hunting VLD will be on your next hunt. To order a free 30 minute video that provides more detail on the bullets, cartridge and velocity used to take several animals at a variety of ranges call 660-460-2802. The VLD (Very Low Drag) bullet design was born from a request made by the US 300 Meter Shooting Team. This successful bullet design soon found its way into all target competitions. Soon, hunters began to pick up the bullet as well once they realized the benefits to accuracy and the effectiveness of Berger’s hydrostatic shock. The VLD bullet design is a combination of two very specific features. The first is a boat tail which is common on long and heavy bullets. The second and most important design feature is the long secant ogive. It is this ogive shape that allows the bullet to experience less drag as it flies to the target. This reduced drag is how the VLD shoots flatter and is less affected by wind (less drift) than other bullets. Reduced drag also translates into higher retained velocity. These are important results if you want your bullet to help improve your accuracy by requiring less sight adjustments when conditions change. Our Hybrid designs blend the best of both worlds by incorporating two different shapes within the nose. As the bearing surface ends, a tangent ogive begins. This tangent section of the ogive results in the bullet being much less sensitive to seating depth. As you move forward along the tangent portion, the shape changes into a secant ogive (the shape used on the VLD bullets). This shape is very efficient in the wind and is why the VLD became so popular. The key to all this is not just the combining of these two shapes but also the partnership between the ballistician and the bullet maker. Berger’s Chief Ballistician, Bryan Litz uses his expertise to combine the appropriate shapes for optimum performance. Our Hunting bullets come in two hybrid types; the Classic Hunter bullet design and the Elite Hunter bullet design. You can expect the same massive hydrostatic shock when hunting with either of these bullet designs that you expect from a Hunting VLD. 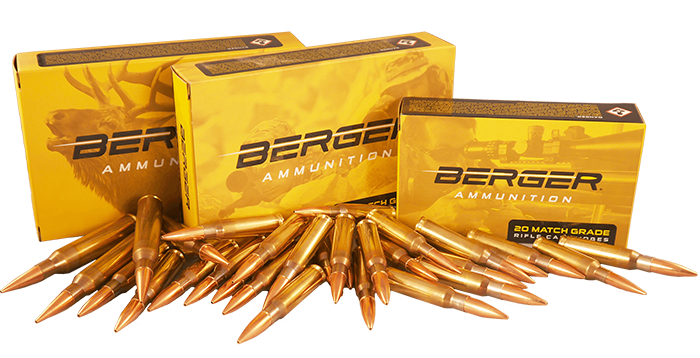 For the first time in Berger’s history, we have purposefully designed a line of hunting bullets that conform to the restrictive dimensional standards set by SAAMI. These bullets were designed for hunters that shoot factory rifles and load at magazine lengths. The Classic Hunter bullets are made with a shorter Hybrid shape nose that comply with SAAMI standards; providing hunters the highest ballistic performance possible in factory rifles and standard magazine lengths. Like the Classic Hunters, these Elite Hunter bullets combine the best of both tangent and secant ogive features, resulting in high ballistic performance with less sensitivity to seating depth. The Elite Hunter bullets are not limited to SAAMI standards, so they have much longer noses than the Classic Hunter bullets to provide hunters with the highest ballistic performance possible.